A recurring theme throughout my career has been to convert the complicated into something simple. Most of the time, I’m doing this through my education. In preparing a session for some meeting planners, I realized that sometimes there are complicated topics that they face – including the topic of how bright the projector should be and the size of the screen. Most people – including AV companies – just guess at how bright the projector needs to be and how large the screen needs to be; however, it really boils down to some well-established math. I dusted off an old spreadsheet I had used to do some calculations for myself for a projector for my office and reworked the calculations to work with conference settings. I’m going to make the spreadsheet available for anyone to use (see the end of this post). With a handful of simple answers, you can get a good understanding of how bright your projector needs to be. From there, you need to figure out how big the letters are going to be natively. That’s typically measured in points. In presentations, most letters are 24 points or larger. For situations where documents or spreadsheets are going to be shown, you assume that the font size will be around 12 points. 72 points are an inch, and computers typically render 92 dots (or pixels) per inch. We can use this to convert into the number of pixels that a font will be rendered. (Font size in points /72 * 92 = font size in pixels.) Knowing how many vertical pixels there are allows us to calculate the screen size. We divide the end size by the number of vertical pixels we get the screen height. Knowing the height and the ratio of height to width (9:16) allows us to calculate the width and the diagonal size of the screen. With the screen size worked out, we have to work on brightness. 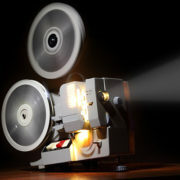 The motion picture industry has historically used footlamberts as a way to measure the light reflected from the screen. The standard for a darkened theatre is 16 footlamberts. That is, every part of the screen reflects at least that much light. For a business setting with lights on, the reasonable range of light in foot lumens is somewhere between 40-50. If we can get to 16 footlamberts in a dark room or near 50 in a bright room, the audience will be able to see well. Because footlamberts are a reflected light, we need to consider how reflective the surface is. A standard whiteboard has a reflectivity of 1. Better screen materials may be able to achieve reflectivity of as much as 1.4 – which means the projector needs to output less light to get the same number of footlamberts. With the size of the screen and the screen reflectivity, we can calculate the number of lumens we need from the projector. That’s a lot of math – but the spreadsheet at the end of this post has all the math handled for you. If you’re looking for something even more simple and straightforward, look at this quick chart with some basic room configurations. The assumptions for the rooms are that there’s two feet from the front of the room to the screen surface, five feet from the screen to the audience and five feet at the back of the room. Finally, we assume a 1.2 reflectivity from a screen (so you have a good screen). If you want to do the numbers yourself and see what you get, you can use this spreadsheet to test configurations yourself.